The theme of the season so far has been that goaltending is carrying the Buffalo Sabres. Carter Hutton showed strongly as the team split the first 4 games followed by Linus Ullmark‘s shutout. With a 3-2 record, despite being out-shot almost every night, play certainly has improved but there is a need to control play. Good goaltending is needed but Buffalo’s five skaters must progress in terms of puck possession to get to the next level. If not, the losses will be like those against Boston and Colorado. Tonight, the Sabres continue their road trip as they attempt to sweep the Golden Knights. The last game showed some of what the blue and gold need to win but as usual, they allowed too many shots. Thankfully, few were difficult for Hutton to handle. If they can continue to give the goaltender clean looks and manage dangerous zones, Buffalo can squeak a win. But the Phil Housley should also look for his team to get to another step forward in offensive play. For a change, the Buffalo Sabres should task themselves to spend more time in the offensive zone. The defensive zone play is vastly better than previous years but goaltenders are due to allow a soft goal or two. The Golden Knights normally dominate the shot clock as well as puck possession metrics but they are missing 3 key pieces. With Alex Tuch, Nate Schmidt, and now Paul Stastny out for some time, Buffalo skaters must take the game to Vegas. They could play the same game as their last meeting and win but that is not a sustainable formula. The Sabres have a mostly healthy lineup and it must create more of a challenge for their opponent. It is essential that they have more shot events against a team known to excel in this regard. The oft-injured defender is on the west coast excursion, meaning he should be close to playing. At practice, Zach Bogosian was paired with Nathan Beaulieu, leading some to believe he may see action soon. Beaulieu has been solid through 4 games, being one of the few positive possession players. Could Bogosian see his first game this season? Reporters have noted that he is itching to go but the coaching staff wants to ensure that he is healthy for the long term. Having played well in an 18 game stint last season, Bogosian and Beaulieu could be an upgraded 3rd pair. And if he does not get injured, he may see himself next to young Rasmus Dahlin down the road. The new left winger came off his best play of the season versus the Coyotes. 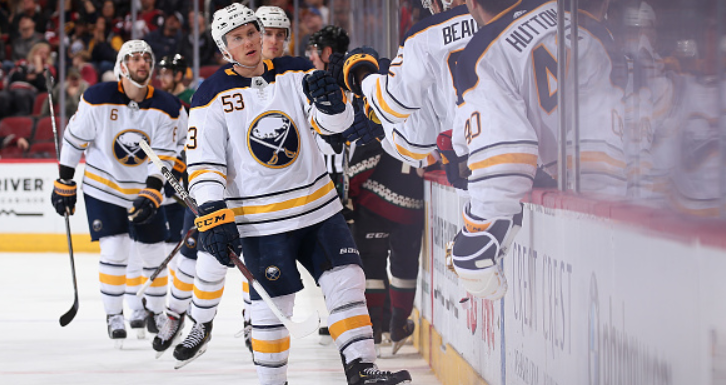 With a goal and assist (on Dahlin’s first NHL goal), Jeff Skinner’s hard work paid off. He has been a positive Corsi player but was not being rewarded for the effort. Goal scorers are streaky. Skinner is considered to be just that. He has shown solid playmaking ability but if he continues to get more shots on goal, he can have a point streak of his own. Against the Knights, this is not an easy task but Skinner has been one the top 5 on 5 goal scorers in the league for a while. He practiced with Casey Mittelstadt in between himself and Kyle Okposo. As Mittelstadt has been good at subtle passes, fans may see these two blossom. For success through the season, the Sabres are counting on Skinner to be a factor and he must produce more regularly. The upcoming UFA cannot make his last performance an anomaly. 3-2 Buffalo: Sabres close the shot gap but goaltending keeps the game from totally opening up.